This book compliments “Drive” by Daniel Pink and would also be of interest to those who like Malcolm Gladwell and the Freakonomics series. Would yo u walk across town to save $7 on a $25 pen at another stationary store? Would you make the same trip to save $7 on a $400 suit? Would you take a red pencil home from work to help your daughter complete a class project? If there was no red pencil would you take $.10 from petty cash to buy one on the way home? This was an entertaining and thought-provoking book. 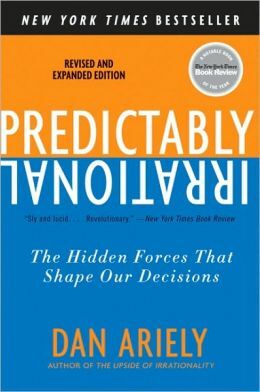 After reading it you may pause and observe some of your biases and how they might influence your decisions. This entry was posted on April 29, 2015 at 3:37 pm and is filed under Adult Readers Advisory, Non-fiction. You can follow any responses to this entry through the RSS 2.0 feed. You can leave a response, or trackback from your own site.